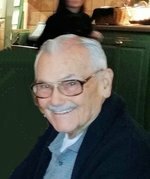 Charlie Horne, 93, of Independence, MO passed away peacefully in his sleep October 29, 2018 after a short illness. A visitation will be held from 9-10am on Saturday, November 3, 2018 at Speaks Suburban Chapel 18020 E. 39th St, Independence, MO, 64055. A service will follow at 10am at the chapel. He will be laid to rest at Mound Grove Cemetery. Charlie was born October 28, 1925 in Independence, MO to Fred and Alberta (Jenkins) Horne. He was the 2nd of 4 children. He graduated high school then enlisted in the United States Navy. After serving in WWII, he came home and worked for Southwestern Bell until his retirement. In May of 1948 he married Margaret Mahr. Together they raised 5 children. He and Margaret enjoyed bowling, vacations, cruises, and the monthly birthday group with friends. In his later days, Charlie spent his time farming and raising cattle in Nebraska. He was active in the Community of Christ Church and served as an elder. He was loved and admired by all who crossed his path and will be deeply missed. He is survived by his children Bill Horne of Independence, MO, Barbara Smith of Independence, MO, Kathy Darling and husband Rick of Derby, KS, Nancy Barklage and husband Don of Irmo, SC, Margaret Hanson and husband Bruce of St. Simon Island, GA; 10 grandchildren; and 15 great-grandchildren. He was preceded in death by his wife of 54 years, Margaret, who passed away in 2002. The family suggests that memorial contributions be made to Alzheimer’s Association, Heartland Chapter. This obituary is protected by copyright by Speaks Chapels. Proudly Serving the Community of Independence. Speaks Chapels is located in the state of Missouri, United States.